Yes, authors are whores. A bit strained as an analogy, perhaps, but think about it. Big presses and small demand that their authors participate actively in marketing. Just as streetwalkers offer their bodies to whoever is interested, so authors like myself have to promote themselves online or in person, marketing their books to the public. Yes, there are differences: whores offer their bodies, whereas authors offer books. But those books are part of you, cooked up in your brain and spun out of your gut. To push the analogy even further, you’re offering your babies, your offspring, your dearest, most cherished progeny. it just looks that way. Notice the gimmicks: witty signs, candy. And just as prostitutes primp themselves up and dress elegant or gaudy so as to catch the eye of lusting males, so authors and publishers know to make each book’s cover as eye-catching as possible, so as to hook prospective buyers. And since everybody knows this, and their books are just as eye-catching as your own, the competition gets intense. And just as streetwalkers know that certain times and places are best for their trade, so authors flock to book fairs and events where prospective buyers are most likely to be found. And just as whores know that their charms will register with some men but not others, so authors at book events like BookCon 2017 at the Javits Convention Center in New York have to get used to some attendees ignoring them or, worse still, lingering at their booth to leaf through a book or two and then put it down and walk away. Having compared notes with an artist friend who exhibits at the Washington Square Art Show twice a year, I know that artists likewise feel rejected when prospective buyers walk away, until a sale redeems them, enhances their feeling of self-worth, and strengthens them for the tests that lie ahead. Kirchner's lady in red. Berlin, circa 1914. A personal note: long ago, having just arrived in Paris as a student, I thought it requisite to get a look at the whores of the notorious neighborhood known as Pigalle, which the wartime GIs had christened “Pig Alley.” One evening, having fortified myself with what was labeled “Pernod Fils,” a pale imitation of the long-banned fearsome absinthe drink of that name, and having stashed a packet of Sheiks in my pocket, I embarked on my perilous adventure with flutters in my virginal gut. There was a station on the Métro called Pigalle, so that’s where I got off and wandered down the nearest quiet street. And sure enough, posted at intervals in the shadows, there they were. “Monsieur …!” purred a short, skinny one in a ratty fur; repelled, I hastened on. “Eh bien …?” (“How about it?”) said a hefty blonde with a throaty voice and an engaging smile, but her too I hurried past. Two or three others cast inviting glances and winked or gestured or purred, but not one whetted my appetite. Finally, having made the requisite effort, I gave it up, left Pigalle by Métro, and retreated to my snug little room in the Hotel François Premier on the Left Bank near the Latin Quarter. In retrospect I’ll admit that, by virtue of her disarming candor and smile, the hefty blonde came closest to scoring with me. Closest, but not close enough. And with these tawdry memories in mind, I hold to my assertion that authors too are whores, repeating in our own somewhat more fastidious way the appeals of the shadowy charmers of Pigalle. Pigalle today. No subtlety, no shadowy charmers. What you see is what you get. But just as not all whores walk the streets, since some are nested in brothels under the guidance of a pimp or a madam, so some authors are lucky enough to find a publisher. They still hawk their wares, but perhaps less blatantly, and with the help of an experienced promoter with whom they split their profits … always to the advantage of that promoter, who must be recompensed for the costs of promotion. Minna Everleigh awaiting customers in Omaha, Nebraska, 1895. Later she and her sister Ada opened the Everleigh Club in Chicago, the most luxurious house of prostitution in the country. just how they felt. One has so much to offer, with no takers in sight. And just as some prostitutes rise to the level of call girls, being available – for a significant price – to those aware of their services, so some authors in time attain the heights of success and the envied status of bestselling author. They don't have to go to their clients; the clients come to them: to readings and signings, even lining up and waiting a half hour for a few precious minutes with the object of their devotion, as I saw them do at BookCon 2017, where they were finally rewarded with a signature in a book already purchased. To these authors, the fame and the glory, plus a New York Times obit and, for the most famous, a splendid funeral. Dumas père. If he looks smug and privileged, he's entitled. His works were translated into over one hundred languages. Victor Hugo's funeral, Paris, 1885. How many authors would rate such a send-off? The most successful of the bestselling authors might even be likened to the grandes horizontales of nineteenth-century France: cultivated and accomplished demi-mondaines who enjoyed the patronage of some illustrious personage, a minister or noble or affluent capitalist. Such was Violetta in Verdi’s opera La Traviata, while at the same time embodying that perennial male fantasy, the whore with a heart of gold. If anyone objects that bestselling authors are by definition known to multitudes of readers, whereas these ladies confined their favors to their benefactor, or at most to a chosen few, I would have to grant the point, while noting that they often presided over a salon frequented by a wider but decidedly male clientele. 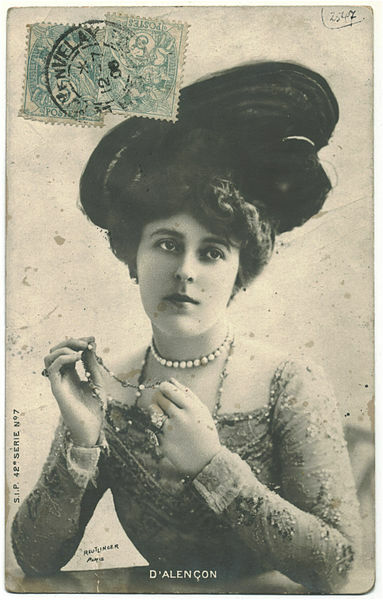 Emilienne d'Alençon (1869-1946). Here at last is elegance. Finally, I will take my analogy one step further and suggest that the whole publishing scene today smacks of whoredom, for publishers too, both big and small, are lustily hawking their authors and books, and competition is fierce, as if a motley crowd of harlots were trying to work the same street, using every trick possible to hook a customer. 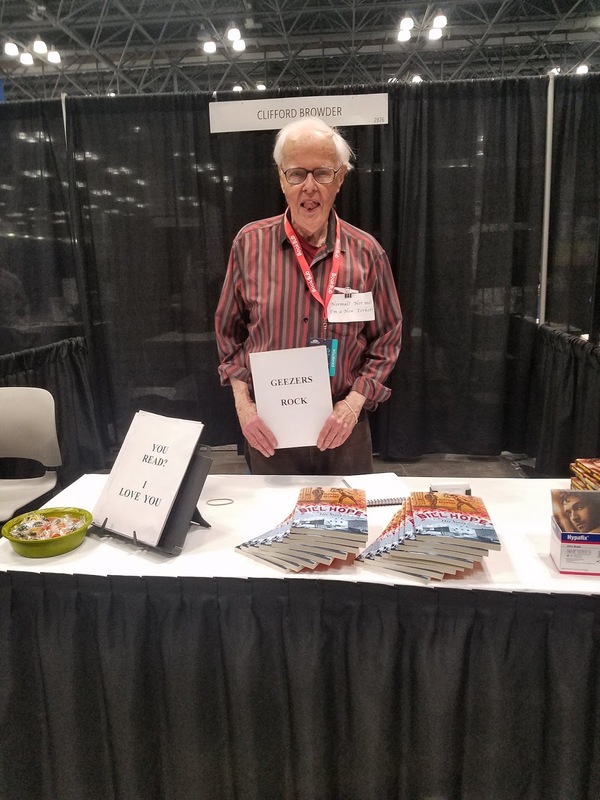 Exhibiting at BookCon 2017, I had exactly that feeling for both myself and my fellow exhibitors, each of us using whatever gimmicks we could think of – banners, signs, free bookmarks, flashing lights – to lure attendees to our booth. Whatever limits my analogy my have, you can’t escape that feeling of exhibiting yourself in public and hoping to score. Every sale was a score, and it made you feel desirable, wanted, a success. Yes, authors are whores. And how about reviewers? They too are for sale. Consider Kirkus Reviews, which touts itself as “the most trusted voice in book reviews since 1933,” and whose reviews can make you or break you. Kirkus offers to review books by indie authors; if the reviews are unfavorable, they can be buried in oblivion, and if favorable, they can be published online, to be discovered by agents, publishers, and readers. So in this case authors are johns, not whores. And of course it costs. For a traditional review, $425; for a longer review, $575; for two books, $699; for three, $999. And for all categories, these are the minimal prices. So Kirkus too is a whore, albeit a successful and distinguished one, a true grande horizontale. Note: A shortened version of this post appeared on November 1, 2017, in "The Artist Unleashed," the blog of Vine Leaves Press. And now I shall hawk my wares.